THINK Marbella and a glamorous jet-set lifestyle springs to mind. The classiest hotels, the liveliest nightclubs and the most fashionable clientele Andalucia, even Spain, has to offer. 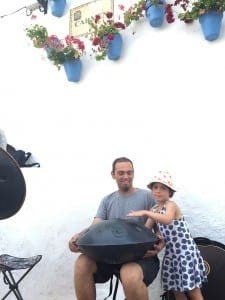 But peeling back ‘Marbs’ mask (you know, all the Arab billionaires, reality TV stars and ex-Premiership footballers) and you’ll find a town steeped in charm and history. Before we go any further, I’ll admit it. I was one of those lucky enough to grow up with a holiday home here, up in the leafy Guadalmina hills. Now while this pretty much meant sun, sand and sea on tap, it also meant many a late night staggering along the infamous second row of Puerto Banus, sometimes known as ‘hurricane alley’. There I was, sprawling out on award-winning beaches by day and crawling out of head-spinning bars by night, totally oblivious to how much more Marbella had to offer. Over a decade later – and no longer a teenager – I am doubly lucky to be living here again (albeit having to work hard, thanks to my boss at the Olive Press). While all the best bits about this tourist honeypot remain more or less the same, I am finally appreciating the culture and history, and so much else has changed, and for the better. And I am certainly making the most of it. The resort has grown into an international brand, becoming one of Spain’s most lucrative tourist destinations. The stats don’t lie. In 2015 Marbella welcomed around three million international tourists and this year is set to be even better. People come here to see and be seen, whether its a hen-do thirsty for a splash of glamour, rubber necks desperate for a glimpse of the latest TOWIE star, or a top politician or celebrity looking for a cultural break. This chameleon-like jewel of the Costa del Sol can adapt to every visitor. 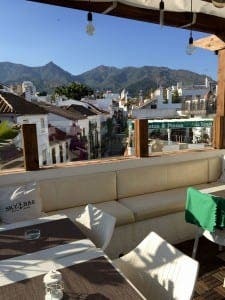 Let’s start with one of the places I know best, more lounge lizard than chameleon; Puerto Banus. Stroll into the port just to the west of Marbella and you’ll witness a scene like no other, depending on the hour. This could include hen-doers trying their best to pull off ill-fitting fancy dress costumes after celebrating their last night of freedom, or members of the ‘1% club’ disembarking from mega-yachts or Ferraris to shop ‘till they drop’ at the likes of Gucci and Prada. Banus has become an unashamed melting pot of the rich, famous and wannabe glamourpusses. The glitz and glamour flows out of the port and along Marbella’s notorious golden mile, home to exclusive nightclubs Le Suite and the extravagant Roberto Cavalli – where a round of drinks could probably blow your weekly budget, if you haven’t already blown it on a swanky designer outfit – an essential if you want to mingle with the who’s who of Marbs. It is on this elusive stretch where the likes of Lord Alan Sugar, Simon Cowell, Sean Connery and the Saudi Arabian royal family have invested in their own villas. 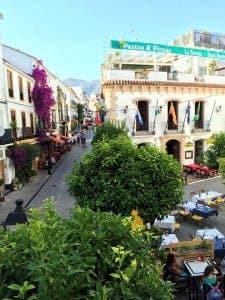 Labelled as the new Ibiza, Marbella exploded onto the international party scene thanks in part to reality TV shows The Only Way Is Marbs and Made In Chelsea, whose drama-packed shows helped shape the area’s image as the place-to-be for the young and famous. When TOWIE aired a two-episode Marbella special last year, hotel searches increased by an incredible 72% overnight. 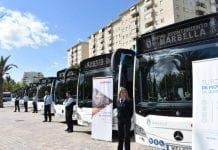 But it’s not just reality TV stars who are raising Marbella’s profile and putting Malaga airport’s second runway into action. World leaders too, like to flock to this Andalucian gem. 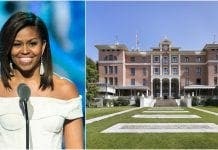 The Olive Press revealed in 2014 that Russian president Vladimir Putin had bought an estate, while we were the only newspaper to speak to Michelle Obama on her famous visit to the ‘casco historico’ in 2010. And there is Britain’s very own David Cameron who has chosen the tourist capital to take a break from running the Western world, not to mention former PM Tony Blair, who has been spotted here twice in the last four years, while actor Hugh Grant is now said to own a home here up in the Zagaleta hills, as does Mark Thatcher (Maggie’s wayward son). It’s quite a list, which could go on and on… and these guys are not here to attend champagne spray parties. So what brings the global political elite to Marbella? 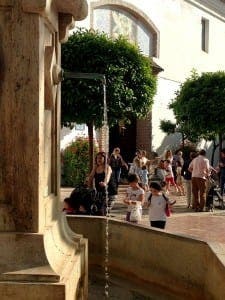 Cue the beautiful old town and Plaza de los Naranjos, AKA Orange Square. At its heart beats Orange Square – named so for its abundance of orange trees – which has been nestled among quaint white houses and narrow streets since the town was re-conquered from the Moors in 1485. An 11th century Arab wall still surrounds the square, while churches, its town hall and the Old Governor’s House all date back to the 16th Century. The most important building in the town is The Church of Saint Mary, whose construction began in 1618. Its main facade is adorned with a stunning red stone entrance worked in Baroque style, while the interior holds the most impressive church organ built in Spain in the last 125 years – consisting of 5000 pewter, copper and wooden pipes and four manual keyboards. The old town oozes charm as you navigate your way through its mosaic-cobbled streets, and after a tapas and cana in the sunshine, there are stylish boutiques, jewellers and wine and ham shops around every corner, not to mention amazing restaurants (mostly away from the square). For the romantics, hop onto one of the horse and carriages for an old school tour, or if you’d rather stay on foot, the scenic park across the old town’s entry boasts a stunning horticultural display and an array of quaint fountains. The town has come a long way since the Romans settled here in 1 AD, but you can still see mementos from their use of it as a population centre – whether it’s the 1st century Roman bridge embedded in the Hotel Puente Romano resort or the baths and settlement ruins in Guadalmina. Even 2000 years ago, the Romans knew that the beach was the place to be, becoming the first civilization to have a coastal real estate boom. Fast forward to 2016 and it seems this hasn’t been lost on the ruling elite of Marbella, who, alongside foreign investors, have invested millions to bring the beaches to the highest of global standards. The 27 kilometres of coastline features over 24 beaches, and San Pedro and Puerto Banus fly the prestigious blue flag after being awarded it for their quality by the Foundation for Environmental Education. The jetsetting crowd flocks to the now internationally renowned Ocean Club and Nikki Beach, where all white-wear and champagne spray parties are the flavour du jour. From May to October, the beautiful and wealthy splash the cash on sunbeds and cocktails to be seen at the coolest sandy spots. But beyond sun, sea and sand, a gastronomical awakening is selling Marbs as a foodie’s paradise. With more than 15 Michelin star restaurants, the resort’s competitive gastro-scene is ensuring vast top quality dining options that will make it almost impossible not to load up on carbs in Marbs. High profile events like A Cuatro Manos at the Puente Romano resort, where chefs with a constellation of 71 Michelin stars between them cooked culinary feats over four days, are giving Marbella some serious street food cred. 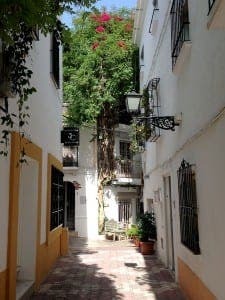 Its art scene is also booming, with a spate of galleries like Houses of Art at the Marbella Club Hotel popping up along the Golden Mile. Meanwhile, the Marbella International Art Festival will see hundreds of pieces of works from artists from more than twenty different countries. Pair this with its booming film scene and its seventh annual Marbella International Film Festival, which is growing in notoriety and hopes to rival Cannes, and you’re looking at a future culture capital of Europe. 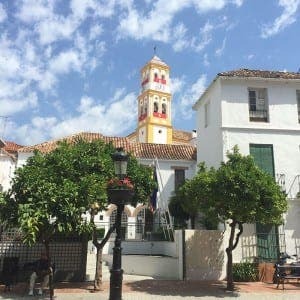 Marbella has come a long way from its fishing village days in the early twentieth century; all thanks to the German Prince Maximilian de Hohenlohe-Langenburg and his son Alfonso – with a little help from some good old British engineering. The pair had to stop in Marbs when they were having trouble with their Rolls Royce in 1946, but Alfonso liked the area so much he decided to buy some land and build himself a house, before selling plots to his Rothschild and Thyssen friends. He soon turned his home into the Costa del Sol’s first luxury hotel in 1954 – The Marbella Club – which to this day remains a mainstay on the Golden Mile. Before long, Ava Gardner, Grace Kelly, Audrey Hepburn and Laurence Olivier were all hanging out there, raising the Costa del Sol’s international profile and attracting a wave of jetsetters and investment. The resort has gone from strength to strength, and continues to grow despite the economic and political woes that have plagued Spain since the financial crash of 2008. Elected last year, mayor Jose Bernal campaigned on ending the institutionalised corruption that had plagued the town for decades, introducing new transparency and integrity rules for those in office, including himself, having most recently made his spending figures public. So with a booming a restaurant scene and an international art and film community, beautiful world class beaches alongside thriving nightlife and shopping, all backed by a corruption-fighting mayor, what more could you ask for? Perhaps an airport with international links, I hear you cry. Well Malaga’s just 45 minutes’ drive away, and Gibraltar the same in the other direction. A day trip to the stunning hilltop citadel of Ronda? Easily doable by car or bus. Surely not a thrilling treetop adventure park? Err, yes, look no further than Aventura Amazonia, in Las Chapas. Suffice to say, whether you’re a foodie, an urban junkie looking for a city break full of history and culture, a beach addict after a classic family holiday, or even a 18-30 reveller thirsty for the best party break, Marbella will always have something for everyone.